A new real point source speaker by DynamiKKs! SoundCraftsmen in a state-of-the-art shape. 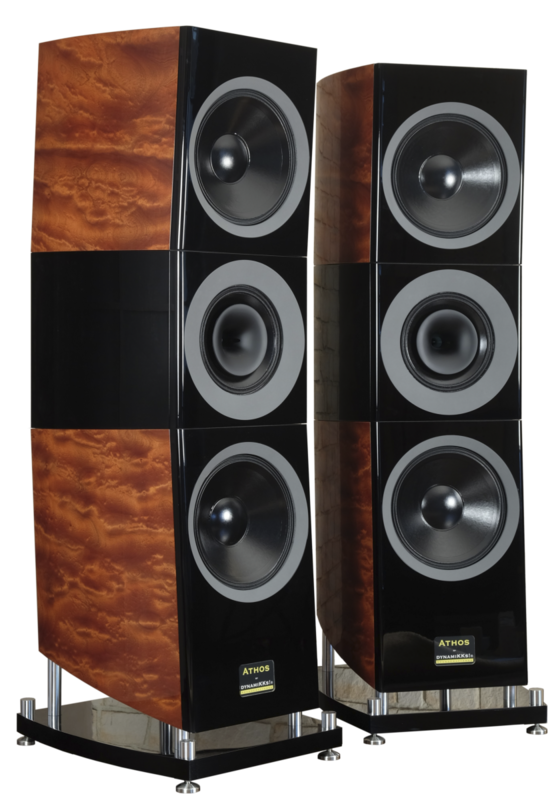 And a truly majestic speaker, which simply impresses by its physical presence: 190cm tall and with a serious 185KG weight. 1 x 12” coaxdriver with waveguide and 2 x 15” bass transducer in wonderful shaped individual housings. And as majestic its appearance is, such is its performance. A big, powerful and dynamic sound, which comes with unsurpassed ease. Crisp highs are paired by a juicy midrange and utterly shaking bass. Something only a speaker of this size can deliver. Looking at them, while they are playing, calls out the question: “what are these huge objects doing within this wonderful presentation of music?” , because they totally disappear acoustically. The Athos knows how to satisfy the needs of very different listeners: for the precision fanatics they are an acoustic magnifying glass of the highest quality, the music lovers are pleased with unimagined intensity in an emotional cosmos covering the full range of music. The ability to dynamic differentiation, the already frightening speed, the airy treble, the incredible lightness and convincing performance is perceived as no longer capable of improvement. As all DynamiKKs! loudspeakers the Athos acts as a point source. This is realized by the use of a coaxial drive unit, that reproduces the frequencies from 150 to 22000 Hz . Fs to 150 hz is managed by 2 mighty 15” bass units in symmetrical dapolito-like arrangement. The point source configuration is the only way that offers a really coherent sound and a precise soundstage, even outside the sweetspot. After a certain time with such a point source the ear becomes so sensitive and focused, that even the sound of the best conventionally made 2-Way- Speakers seems to be divided into two parts, not to mention 3- or 4- way-speakers. This process takes a little time, but is even more clearly then. In addition to the better quality playback, this also means a more relaxed listening, because our CPU, our brain, has to apply less power to calculate the sound coherent, which is on the other hand necessary in case of conventional multi-way-speakers. 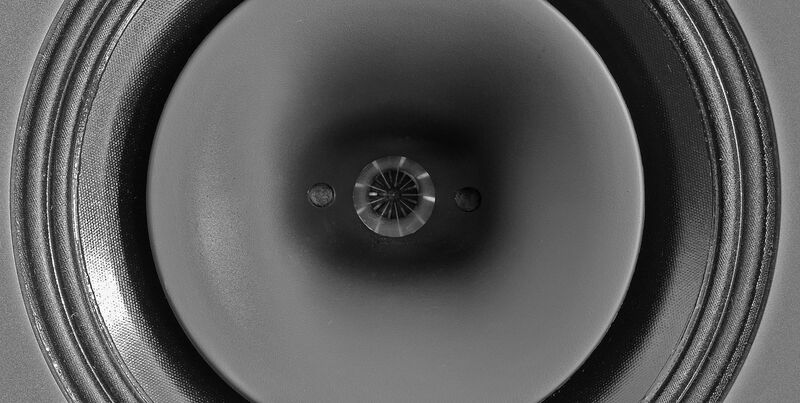 The coax driver uses a 12 inch midbass cone from specially treated paper, loaded by a short waveguide for a smooth transition to the front of the cabinet. It is lightweight, which is crucial for unlimited dynamics. The 1.75 inch tweeter diaphragm is made of pure titanium and works on a big round horn. Unlike conventional round horns the chosen geometry gives 60 degree dispersion in the horizontal plane and 40 degrees in the vertical, which reduces unwanted reflections from the floor and the ceiling. It is made by antiresonant material and allows a deep crossover point. The voice coils of both drivers are powered by the same gigantic magnet system, which has advantages over separate flanged compression drivers as in usual coaxial drivers of this kind. The crossover network is placed in a separate compartment to avoid microphonic effects. The speakers efficiency is high and the impedance curves are very balanced across the frequency without pronounced minimum or maximum impedances, there are no extreme phase shifts associated by extreme capacitive and inductive loads. The electrical phase does not exceed +-25 degrees! Therefore the Athos harmonizes perfectly with all sorts of amplifiers. Adjustable feet ensure a plane-parallel installation, indispensable for precise imaging and 3-dimensional sound reproduction. The Athos is made for the experienced listener, who wants to experience the full beauty and emotional impact which recordings keep secret until revealed.